Did you know that the term 'The Full Monty' is an old Parisian expression that means 'To grab a one-eyed solder in the neither regions with a firm grasp'? 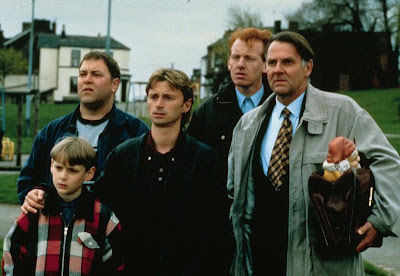 Or then again, maybe it is about whatever is going on with these chaps in this movie Directed by Peter Cattaneo; and Actors: Robert Carlyle, Tom Wilkinson, and Mark Addy. It was made in 1997, and lasted for 91-minutes. Poor Gaz (Robert Carlyle). He's got no job. He lives in a dingy flat. His ex-wife does not like their son hanging around with him. Plus his best-friend, Dave (Mark Addy), is a fat b*stard. What's he going to do? Commit suicide? As that is what his new pal, Lomper (Steve Huison), attempts when he and Dave first meet him. No. Thankfully, not that. Instead, Gaz becomes intrigued by a suggestion made to him by Dave at job-club - strip for cash like the Chippendales do. Granted, at first, this comment is treated as nothing more than jest by Gaz and his pals. However, because of the hopeless climate that they face, compiled with the need to earn some money, over time this seems like a prosperous way out of poverty for all of them. Still, who can they now turn to, to aide them in this venture, huh? Yes. That's correct. Their old boss, Gerald (Tom Wilkinson), because he is a very good dancer don't you know. Plus, in addition to this, they also hire two more men to participate in this scheme with them as well, Horse (Paul Barber) and Nathan (William Snape). Great news, because all they have to do next, is to learn how to strip in unison. No problem. You see, if it wasn't bad enough that these men are not what I would call the most rhythmical bunch in the world, worst still, is that all of their nightmares come back to haunt them with a vengeance as time ticks on. For a start, because Dave thinks that he has a weight problem -- he takes a job as a security guard and pulls out of this strip-fest. Next, Gerald's wife finds out that he is has been unemployed for six months -- and kicks him out of his home. Plus to make matters even more strained for one and all, while the remaining guys try to practice their routine in a disused warehouse -- some of them get temporarily detained by the police whom catch them in the act, resulting in Gaz's ex-wife to take their kid away from him. Well, I suppose that is why what next transpires is a right free for all I can tell you. As reunions are jaunty - tales are not by Charlotte Bronte - glamour is not necessarily diamante - and get ready for the full Monty. Now who would have thought that a film about unemployed people from the North of England stripping could be so much fun! Well, that is what I first thought about 'The Full Monty' when I sat down to watch it! Just look at the facts: (1) Yes - all the actors did strip for the final scene in front of a live audience. (2) American studio executives did not understand the title of this film -- as they thought that it was about someone called Monty. (3) Prince Charles jovially re-enacted the unemployment office scene in 1998, with some young members of the Prince's Trust for television. (3) Because the film was originally running short, a couple of the montage scenes were recorded three months later. (4) The American version had special leaflets printed because English slang was used in this flick. (5) The working title for this film was "Eggs, Beans and Chippendales". (6) The film holds the record for the highest-grossing UK film in history, grossing a total of $256.9 million [£160.5 million]. (7) This movie was made into a 2000 Broadway musical. And (8) Both Rik Mayall and Nicholas Lyndhurst were considered for the role of Gaz. But Nicholas turned it down just in case it was cold at that time of year. Also, Danny Boyle turned down the chance to direct this film too, because he did not like the story that much. 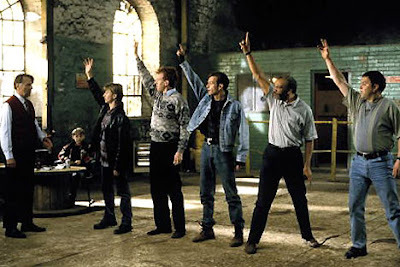 OK, so now that my noggin is a bit more loose without all those pieces of trivia floating around my brain - 'The Full Monty' - why is it such a great English classic? Well, I could just fob you off by saying that if Prince Charles thinks it's a good story, then so should you too. However, I am not like that. Instead, I would just like to say that this movie does a number of great things on a number of different levels. For a start, it is a story that shows how people can sometimes go to any lengths to get on in life; because society and the harsh realities of existence can sometime make people do some really funny things. Then, on another level, it's about comradeship, and how having good friends around you is better than a pot of gold at times. Moreover, on yet another level, this comedy is about character and pathos, and how a daring attitude and a 'blinkered' way of looking at things can make life all the more sweeter. Oh! Plus on top of that, I have to mention the actors and the music, right? Now where the actors are concerned all I can say is "YES". Beause every single one of them brings something to the table that is just exquisite to watch. Carlyle is the jack the lad. Mark is the frumpy friend with low self-esteem. Tom plays the mannered authoritarian to a tea. Plus Steve, Paul, and William, play the supporting parts that really do support this movie. Comedy gold - always worth a watch.